The choice of material is very important and will depend on your preference for Granite, Marble or a natural native stone. Granite is quarried from a variety of countries and varies greatly in colour and price. The main colours available are in Red, Black, Blue and Grey but more unusual colours and shades are becoming popular. Granite is normally more expensive than marble and may be double the price in some designs as it is a difficult material to shape and cut. This hardness ensures that the memorial is almost maintenance free. Usually, the lettering is engraved into the stone and painted in gold, black or silver to stand out. Alternatively, leaded letters can be added but they are more difficult to fix than in marble. 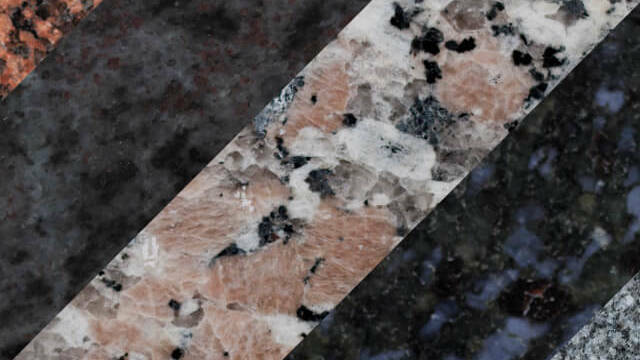 Granite is sourced from all over the World and is available in many colours including black, grey, blue and red. Granite is often highly polished to create a bright, colourful appearance but a more subtle, matt finish can be achieved for a traditional style. Virtually all granites require very little maintenance and only weather slowly over time. Marble Quarried in Carrara, North West Italy, this material is classically white to blue-white in colour and veined with darker blue/grey markings. Marble can also be seen in a darker blue/grey colour called Dove grey marble. The main advantage of marble is that it can be carved and shaped by hand to produce attractive and intricate designs. Marble is a long lasting stone but it should be cleaned periodically to reduce the effects of weathering as the pores of the stone can soak up dirt. It is for this reason, that marble stones should never be fixed on graves that lie beneath trees or bushes, as leaves and bird droppings will leave permanent stains. Native stones such as York, Portland and Slate provide a more traditional appearance and can be carved and shaped by hand by our skilled masons. A number of designs are shown but these memorials are often made to order to incorporate a special engraving or feature. Indeed, all materials can be shaped and carved to meet your particular need. It is also possible to combine different styles and to re-produce any design in any material. Our trained advisors are available 5 days a week (Monday-Friday) to help you with these decisions and drawings and proofs can be produced to ensure that your exact requirements are met. We have a long history of meeting these standards and making memorials that are truly a tribute to the ones we wish to remember. The downloadable guide provides an indication of the colour and shading of the various stones. However, it is important to remember that all materials are naturally formed and may differ slightly in texture or colour from the panel shown on the swatch. Please speak to one of our advisors if you have any particular enquiries. All of our memorials are supplied from our own factory. This allows us to control the quality of the work and to make certain that each one is produced on time and to the right specification. Call us on Freephone 0800 377 7057, email chris@aklander.co.uk or view our step by step guide.